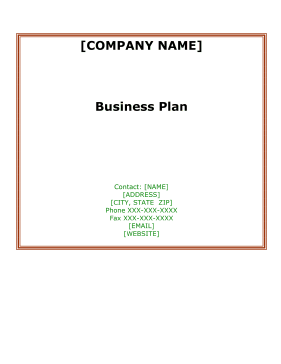 This free, printable business plan helps catering companies learn their competitive advantages in terms of location, accessibility, product, range and flexibility compared to others in the restaurant and dining market. • Special Events, Association banquets, Trade Shows, etc. The owner of the Company is [NAME] who has brings over 15 years' experience in the Restaurant industry. The restaurant is minutes away from a major shopping center and sits off of a highly traveled intersection of Interstate X, US Highway X and State Highway X. The building contains 33,000 square feet of commercial space with approximately 150+ parking spaces available on site. [COMPANY NAME] was established in May 2005 and is headquartered in [CITY], [STATE]. The Company prides itself on its customer service. [COMPANY NAME] offers a lunch, dinner, or appetizer menu. From delectable appetizers to delicious dinners of steak, chicken pork, pasta and even prime rib, [COMPANY NAME] serves up meals to delight anyone's taste-buds. The burger selection is one-of-a-kind. The Company also has unique specials and has something on the menu for every kind of taste bud. [COMPANY NAME] offers a place for a wedding or special event. With one large banquet hall and two additional meeting rooms that can be joined together, [COMPANY NAME] can accommodate any size gathering comfortably. The Company's facility offers televisions to watch sports events, Bingo games at the bar, pool tables, darts, dining, dancing, wedding facilities, anniversary facilities, class reunion facilities, book reading areas, seminar training, or party facilities. [COMPANY NAME]'s competitive advantage is its visibility, accessibility and location. Equally important is the unique environment, food quality, and extensive experience in the food and banquet industry. The Company is seeking grant funding in the amount of $800,000. The grant will be used to expand the business by improving the exterior landscaping, repairing the parking lot, improving the building cosmetically, increase advertising/ promotions and hire additional staff. Based on the detailed financial projections, [COMPANY NAME]'s future sales for 2010, 2011 and 2012 are expected to be $1,500,000, $1,600,000 and $1,750,000. [COMPANY NAME]'s mission is to provide a full service premier dining, banquet and event facility for families, businesses and other community functions throughout the surrounding non-metro local area of [CITY], [STATE], and throughout the County of[COUNTY], located in Central [STATE]. The restaurant strives to be a good corporate and civic partner promoting activities and events that benefit the community, its businesses and the surrounding area. The restaurant will host Youth entertainment events that present excellent fund raising opportunities for the community. [COMPANY NAME]'s business philosophy is to provide a dining and event experience that caters to individuals and businesses unique and special needs. The Company strives to handle all details of the experience so that the customer can relax and be catered to.